Too much learning, not enough time! 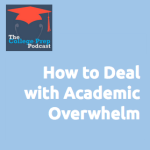 Overwhelm is a common experience for students in school, and to some degree, it is part of the process of learning. We can’t always control whether or not we get overwhelmed in the first place, but we can control how we respond to it. Also, the brain science video that Gretchen recommended is right here. Plus, you might want to try some of the activities that Bara Sapir leads in this video; they’re GREAT for managing anxiety and overwhelm.